The year 1899 was not a good one for the family of George DeWald, one of Fort Wayne's pioneer merchants. Born in 1831 in Germany, DeWald came to Fort Wayne at the age of 18 and quickly built up a retail dry goods store at the northeast corner of Calhoun and Columbia streets. Under DeWald's guidance, the dry goods store flourished until December 27, 1899, when a disastrous fire gutted the store and destroyed more than $175,000 in merchandise. George DeWald, though, never saw the blaze. He had died abut six months earlier, on June 27, 1899. 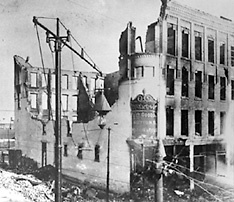 At that time, the fire was the worst to ever strike a Summit City department store. Even so, the company quickly rebounded under the direction of George DeWald's oldest son, Robert W.T. DeWald. Reorganized in 1900, the George DeWald Co. moved into the wholesale business - a business which was thriving by the time Griswold wrote his history in 1917. George DeWald - the young man from Germany who became a successful Fort Wayne retailer - is today remembered by the street which bears his name.